I can honestly say I've never cried for the song 'Battle Hymn of the Republic'. It had been too many weeks since we made it to the pews of our church. Between a special monthly kids service (called Kids Stuff) for the parents too, nursery duty, lice (ya, bleck! ), an annual soccer tournament that was on a Sunday (boo hiss), and Frankenstorm Sandy (no heat, no electricity that week) I hadn't sat in the sanctuary to worship since September. I was a little emotional to begin with (Congregational Worship stirs up an emotion I cannot explain. It is my soul, the Spirit, unleashed.) But then to top it all off it was Veterans Day, a day that stirs up so much emotion for me as well. A reminder of the sacrifices US Military Members (and their families) have made since at least the Revolutionary War. There we are before the offertory and our choir leader asks all the Veterans to stand up. My husband leans over and asks, "Do I have to?" and I nod, yes. The congregation gives a rousing round of applause and the veterans from 20 years old to 80 years old quickly stand and just as quickly and so very humbly sit back down. The offertory begins and the choir starts "The Battle Hymn of the Republic". About half way through the entire congregation stood, almost like a standing ovation, but mid-song. We recognized that this emotion we all were feeling was not something we could handle sitting on our dufts. It was a moment to stand and say 'Thank you, God' Thank you for the soldiers, coast guard, sailors, the marines and airmen. Thank you for their sacrifices, for the freedom that you have given us. Thank you God for the freedom to be Americans. The choir director turned around to have us join in the last few verses and she was astonished. She had no idea she was going to turn around to an already standing room. And my tears started flowing. The lyrics coming out of my mouth were shaky. The moisture on my cheeks a little uncomfortable in the crowd. Then I saw the kleenex wipe tears away from the lady right in front of me, the young woman doing the same across the aisle, it was happening throughout the room. There was gritty emotion in that song, in that moment. To all US Veterans I say, "Thank You". A special Thank you to my husband, prior Marine and current Army National Guard; my dad, Air Force Retired; my grandfathers, Army Soldiers in World War II; both of my Uncle Johns, both served during Vietnam; my cousins Bob (Navy), Jason (Navy) , Luci (Marines), John (Marines), Tony (Navy), Cory (Army), Fred (Marines). You have all served our nation with honor. Thank you! PS I was honored to be asked to take part in a Veterans Day presentation from Veterans United. I stand very strongly by what I shared with them. 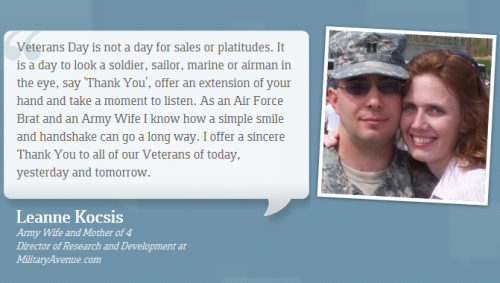 How will you thank a Veteran today?